The brand new Conquest mode is an intense, 15 minute battle between 2 teams of 6 players. Skill, strategy, and teamwork are key if players want to get their hands on the top rewards. Find out all about Conquest below. Note: This game mode will be available after this week's update. The first season will end on August 28. We will improve it based on your feedbacks, then release it again. Stay tuned! 1. 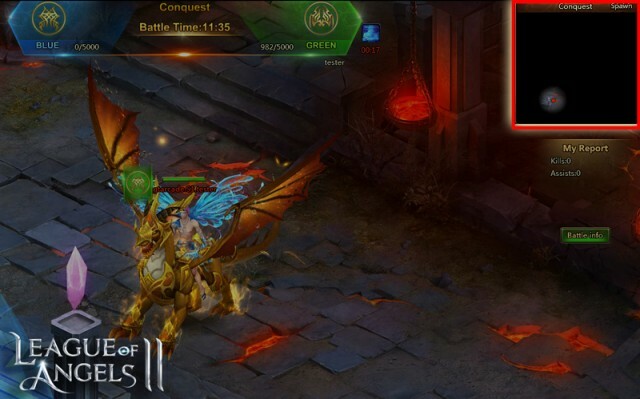 Conquest is a cross-server PvP game mode in the form of a 6v6 battle. 2. 12 Players are auto-matched based on their level and B.R. and placed into 2 opposing teams (Blue and Green). 1. Capture Crystals on the map by having more players in the circle until it moves to your side, captured Crystals will generate points every second for your team. Players also earn points by killing enemy players. Each team’s total points will ultimately decide the winner. 2. Conquest Lasts 12 minutes. First team to reach 5000 Battlefield Points will be the winner. After 12 minutes, if neither team has reached 5000 points, the battle will go into Sudden Death. 3. If the result is still a tie, both sides will receive a defeat. This mode lasts 3 minutes, no respawn after death, kill the opposing team or have more points at the end to win. - HP Restored: At the start of Sudden Death, everyone’s HP will be restored. - Point Bonus: Killing the entire enemy team during sudden death will reward an extra 900 points. 1. Kill enemies and capture Crystals to gain Battlefield Points. Capture the Top Crystal to get 3 points per second. Capture the Middle Crystal to get 5 points per second. Capture the Bottom Crystal to get 4 points per second. Kill an opposing player to earn 20 points. 1. Use the Mist item to cause your enemies’ map to be covered by a mist lasting 20 seconds. This duration can stack. 2. Each player gets 1 free attempt to use. ▶Winning players Lv. 30 to 54: Chance to get Legendary Relics, Lv.6 Rune Pack, and other common resources. ▶Winning players Lv. 55 to 79: Chance to get Mythic Relics, Lv.6 Rune Pack, Enchantment Stone, Engraving Stone, and other common resources. ▶Winning players Lv. 80 and above: Same rewards as previous, plus Soulstones and Bloodstones. ▶Defeated players: The losing side will receive common resources as rewards. 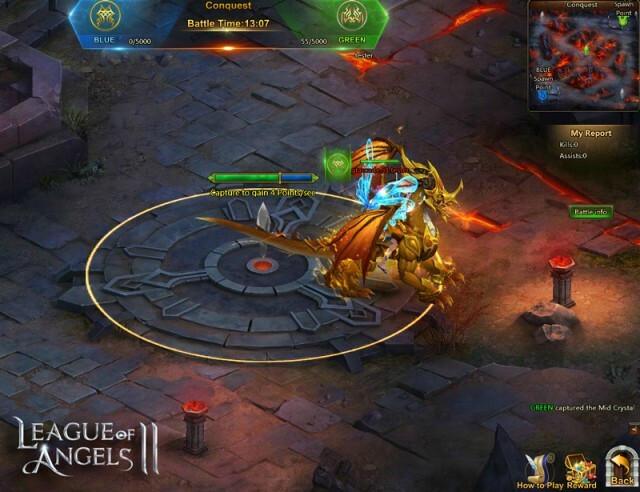 League of Angels II takes PvP to a whole new level with Conquest! What unique strategies will you come up with to conquer their opponents? Do you have what it takes to lead your team to victory? Prove yourselves in Conquest!